Logging and Log Management: The Authoritative Guide to Understanding the Concepts Surrounding Logging and Log Management introduces information technology professionals to the basic concepts of logging and log management. It provides tools and techniques to analyze log data and detect malicious activity. The book consists of 22 chapters that cover the basics of log data; log data sources; log storage technologies; a case study on how syslog-ng is deployed in a real environment for log collection; covert logging; planning and preparing for the analysis log data; simple analysis techniques; and tools and techniques for reviewing logs for potential problems. The book also discusses statistical analysis; log data mining; visualizing log data; logging laws and logging mistakes; open source and commercial toolsets for log data collection and analysis; log management procedures; and attacks against logging systems. In addition, the book addresses logging for programmers; logging and compliance with regulations and policies; planning for log analysis system deployment; cloud logging; and the future of log standards, logging, and log analysis. 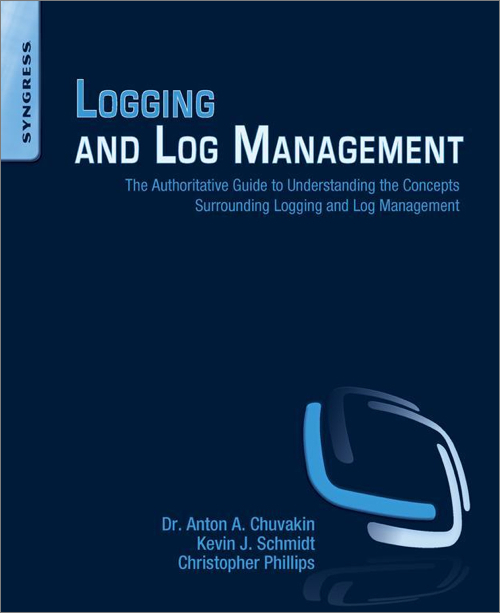 This book was written for anyone interested in learning more about logging and log management. These include systems administrators, junior security engineers, application developers, and managers.